"Salk" redirects here. For other uses, see Salk (disambiguation). 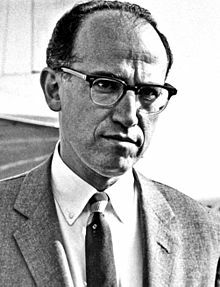 Jonas Edward Salk (/sɔːlk/; October 28, 1914 – June 23, 1995) was an American medical researcher and virologist. He discovered and developed one of the first successful polio vaccines. Born in New York City, he attended the City College of New York and New York University School of Medicine, later choosing to do medical research instead of becoming a practicing physician. In 1939, after earning his medical degree, Salk began an internship as a physician scientist at Mount Sinai Hospital. Two years later he was granted a fellowship at the University of Michigan, where he would study flu viruses with his mentor Thomas Francis, Jr.
Until 1955, when the Salk vaccine was introduced, polio was considered one of the most frightening public health problems in the world. In the postwar United States, annual epidemics were increasingly devastating. The 1952 U.S. epidemic was the worst outbreak in the nation's history. Of nearly 58,000 cases reported that year, 3,145 people died and 21,269 were left with mild to disabling paralysis, with most of its victims being children. The "public reaction was to a plague", said historian William L. O'Neill. "Citizens of urban areas were to be terrified every summer when this frightful visitor returned." According to a 2009 PBS documentary, "Apart from the atomic bomb, America's greatest fear was polio." As a result, scientists were in a frantic race to find a way to prevent or cure the disease. In 1947, Salk accepted an appointment to the University of Pittsburgh School of Medicine. In 1948, he undertook a project funded by the National Foundation for Infantile Paralysis, the organization that would fund the development of a vaccine, to determine the number of different types of polio virus. Salk saw an opportunity to extend this project towards developing a vaccine against polio, and, together with the skilled research team he assembled, devoted himself to this work for the next seven years. The field trial set up to test the Salk vaccine was, according to O'Neill, "the most elaborate program of its kind in history, involving 20,000 physicians and public health officers, 64,000 school personnel, and 220,000 volunteers." Over 1,800,000 school children took part in the trial. When news of the vaccine's success was made public on April 12, 1955, Salk was hailed as a "miracle worker" and the day almost became a national holiday. Around the world, an immediate rush to vaccinate began, with countries including Canada, Sweden, Denmark, Norway, West Germany, the Netherlands, Switzerland, and Belgium planning to begin polio immunization campaigns using Salk's vaccine. Salk campaigned for mandatory vaccination, claiming that public health should be considered a "moral commitment." Salk claimed that his sole focus had been to develop a safe and effective vaccine as rapidly as possible, with no interest in personal profit, and credited this attitude with the fact that there is no patent for the vaccine. However, there would have been no patent either way, as the vaccine was already ruled to be unpatentable due to prior art. In 1960, he founded the Salk Institute for Biological Studies in La Jolla, California, which is today a center for medical and scientific research. He continued to conduct research and publish books, including Man Unfolding (1972), The Survival of the Wisest (1973), World Population and Human Values: A New Reality (1981), and Anatomy of Reality: Merging of Intuition and Reason (1983). Salk's last years were spent searching for a vaccine against HIV. His personal papers are stored at the University of California, San Diego Library. Salk was born in New York City on October 28, 1914. His parents, Daniel and Dora (née Press) Salk, were Ashkenazi Jewish; Daniel was born in New Jersey to eastern European immigrant parents, and Dora was born in the Russian Empire, immigrating when she was twelve. They had not received extensive formal education. He had two younger brothers, Herman and Lee, a renowned child psychologist. The family moved from East Harlem to 853 Elsmere Place, the Bronx, with some time spent in Queens where he resided at 439 Beach 69th Street, Arverne, New York. Salk enrolled in CCNY from which he earned a Bachelor of Science degree in chemistry in 1934. Oshinsky writes that "for working-class immigrant families, City College represented the apex of public higher education. Getting in was tough, but tuition was free. Competition was intense, but the rules were fairly applied. No one got an advantage based on an accident of birth." As a child, Salk did not show any interest in medicine or science in general. He said in an interview with the Academy of Achievement, "As a child I was not interested in science. I was merely interested in things human, the human side of nature, if you like, and I continue to be interested in that." After City College, Salk enrolled in New York University to study medicine. According to Oshinsky, NYU based its modest reputation on famous alumni, such as Walter Reed, who helped conquer yellow fever. Tuition was "comparatively low, better still, it did not discriminate against Jews, ... while most of the surrounding medical schools—Cornell, Columbia, University of Pennsylvania, and Yale—had rigid quotas in place." Yale, for example, accepted 76 applicants, in 1935, out of a pool of 501. Although 200 of the applicants were Jewish, only five got in. :98 During his years at New York University Medical School, Salk worked as a laboratory technician during the school year and as a camp counselor in the summer. During Salk's medical studies, he stood out from his peers, according to Bookchin, "not just because of his continued academic prowess—he was Alpha Omega Alpha, the Phi Beta Kappa Society of medical education—but because he had decided he did not want to practice medicine." Instead, he became absorbed in research, even taking a year off to study biochemistry. He later focused more of his studies on bacteriology which had replaced medicine as his primary interest. He said his desire was to help humankind in general rather than single patients. "It was the laboratory work, in particular, that gave new direction to his life." According to Salk: "My intention was to go to medical school, and then become a medical scientist. I did not intend to practice medicine, although in medical school, and in my internship, I did all the things that were necessary to qualify me in that regard. I had opportunities along the way to drop the idea of medicine and go into science. At one point at the end of my first year of medical school, I received an opportunity to spend a year in research and teaching in biochemistry, which I did. And at the end of that year, I was told that I could, if I wished, switch and get a Ph.D. in biochemistry, but my preference was to stay with medicine. And, I believe that this is all linked to my original ambition, or desire, which was to be of some help to humankind, so to speak, in a larger sense than just on a one-to-one basis." Concerning his last year of medical school Salk says: "I had an opportunity to spend time in elective periods in my last year in medical school, in a laboratory that was involved in studies on influenza. The influenza virus had just been discovered about a few years before that. And, I saw the opportunity at that time to test the question as to whether we could destroy the virus infectivity and still immunize. And so, by carefully designed experiments, we found it was possible to do so." In 1941, during his postgraduate work in virology, Salk chose a two-month elective to work in the laboratory of Thomas Francis at the University of Michigan. Francis had recently joined the faculty of the medical school after working for the Rockefeller Foundation, where he had discovered the type B influenza virus. According to Bookchin, "the two-month stint in Francis's lab was Salk's first introduction to the world of virology—and he was hooked. ":25 After graduating from medical school, Salk began his residency at New York's prestigious Mount Sinai Hospital, where he again worked in Francis's laboratory. In 1947, Salk became ambitious for his own lab and was granted one at the University of Pittsburgh School of Medicine, but the lab was smaller than he had hoped and he found the rules imposed by the university restrictive. In 1948, Harry Weaver, the director of research at the National Foundation for Infantile Paralysis, contacted Salk. He asked Salk to find out if there were more types of polio than the three then known, offering additional space, equipment and researchers. For the first year he gathered supplies and researchers including Julius Youngner, Byron Bennett, L. James Lewis, and secretary Lorraine Friedman joined Salk's team, as well. As time went on, Salk began securing grants from the Mellon family and was able to build a working virology laboratory. He later joined the National Foundation for Infantile Paralysis's polio project established by President Franklin D. Roosevelt. Extensive publicity and fear of polio led to much increased funding, $67 million by 1955, but research continued on dangerous live vaccines. :85–87 Salk decided to use the safer 'killed' virus, instead of weakened forms of strains of polio viruses like the ones used contemporarily by Albert Sabin, who was developing an oral vaccine. After successful tests on laboratory animals, on July 2, 1952, assisted by the staff at the D.T. Watson Home for Crippled Children, Salk injected 43 children with his killed-virus vaccine. A few weeks later, Salk injected children at the Polk State School for the retarded and feeble-minded. In 1954 he tested the vaccine on about one million children, known as the polio pioneers. The vaccine was announced as safe on April 12, 1955. Magazine photo of Jonas Salk to O'Neill, "the most elaborate program of its kind in history, involving 20,000 physicians and public health officers, 64,000 school personnel, and 220,000 volunteers," with over 1,800,000 school children participating in the trial. A 1954 Gallup poll showed that more Americans knew about the polio field trials than could give the full name of the President. 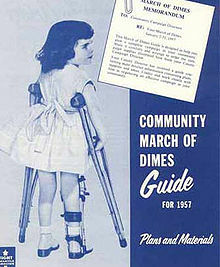 The project became large, involving 100 million contributors to the March of Dimes, and 7 million volunteers. :54 The foundation allowed itself to go into debt to finance the final research required to develop the Salk vaccine. Salk worked incessantly for two and a half years. Salk's inactivated polio vaccine was the first vaccine for the disease; it came into use in 1955. It is on the World Health Organization's List of Essential Medicines, the most effective and safe medicines needed in a health system. Salk preferred not to have his career as a scientist affected by too much personal attention, as he had always tried to remain independent and private in his research and life, but this proved to be impossible. "Young man, a great tragedy has befallen you—you've lost your anonymity", the television personality Ed Murrow said to Salk shortly after the onslaught of media attention. When Murrow asked him, "Who owns this patent? ", Salk replied, "Well, the people I would say. There is no patent. Could you patent the sun?" The vaccine is calculated to be worth $7 billion had it been patented. However, lawyers from the National Foundation for Infantile Paralysis did look into the possibility of a patent, but ultimately determined that the vaccine was not a patentable invention because of prior art. Salk served on the board of directors of the John D. and Catherine T. MacArthur Foundation. Author Jon Cohen noted, "Jonas Salk made scientists and journalists alike go goofy. As one of the only living scientists whose face was known the world over, Salk, in the public's eye, had a superstar aura. Airplane pilots would announce that he was on board and passengers would burst into applause. Hotels routinely would upgrade him into their penthouse suites. A meal at a restaurant inevitably meant an interruption from an admirer, and scientists approached him with drop-jawed wonder as though some of the stardust might rub off." For the most part, however, Salk was "appalled at the demands on the public figure he has become and resentful of what he considers to be the invasion of his privacy", wrote The New York Times, a few months after his vaccine announcement. The Times article noted, "at 40, the once obscure scientist ... was lifted from his laboratory almost to the level of a folk hero." He received a presidential citation, a score of awards, four honorary degrees, half a dozen foreign decorations, and letters from thousands of fellow citizens. His alma mater, City College of New York, gave him an honorary degree as Doctor of Laws. But "despite such very nice tributes", The New York Times wrote, "Salk is profoundly disturbed by the torrent of fame that has descended upon him. ... He talks continually about getting out of the limelight and back to his laboratory ... because of his genuine distaste for publicity, which he believes is inappropriate for a scientist." During a 1980 interview, 25 years later, he said, "It's as if I've been a public property ever since, having to respond to external, as well as internal, impulses. ... It's brought me enormous gratification, opened many opportunities, but at the same time placed many burdens on me. It altered my career, my relationships with colleagues; I am a public figure, no longer one of them." He enjoys talking to people he likes, and "he likes a lot of people", wrote the Times. "He talks quickly, articulately, and often in complete paragraphs." And "He has very little perceptible interest in the things that interest most people—such as making money." That belongs "in the category of mink coats and Cadillacs—unnecessary", he said. In the years after Salk's discovery, many supporters, in particular the National Foundation, "helped him build his dream of a research complex for the investigation of biological phenomena 'from cell to society'." 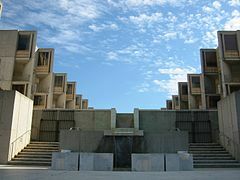 Called the Salk Institute for Biological Studies, it opened in 1963 in the San Diego neighborhood of La Jolla. Salk believed that the institution would help new and upcoming scientists along in their careers, as he said himself, "I thought how nice it would be if a place like this existed and I was invited to work there." This was something that Salk was deprived of early in his life, but due to his achievements, was able to provide for future scientists. Although he is distinctly future-oriented, Dr. Salk has not lost sight of the institute's immediate aim, which is the development and use of the new biology, called molecular and cellular biology, described as part physics, part chemistry and part biology. The broad-gauged purpose of this science is to understand man's life processes. There is talk here of the possibility, once the secret of how the cell is triggered to manufacture antibodies is discovered, that a single vaccine may be developed to protect a child against many common infectious diseases. There is speculation about the power to isolate and perhaps eliminate genetic errors that lead to birth defects. Dr. Salk, a creative man himself, hopes that the institute will do its share in probing the wisdom of nature and thus help enlarge the wisdom of man. For the ultimate purpose of science, humanism and the arts, in his judgment, is the freeing of each individual to cultivate his full creativity, in whichever direction it leads . ... As if to prepare for Socratic encounters such as these, the institute's architect, Louis Kahn, has installed blackboards in place of concrete facings on the walls along the walks. At the institute, a magnificent complex of laboratories and study units set on a bluff overlooking the Pacific, Dr. Salk holds the titles of founding director and resident fellow. His own laboratory group is concerned with the immunologic aspects of cancer and the mechanisms of autoimmune disease, such as multiple sclerosis, in which the immune system attacks the body's own tissues. In an interview about his future hopes at the institute, he said, "In the end, what may have more significance is my creation of the institute and what will come out of it, because of its example as a place for excellence, a creative environment for creative minds." Francis Crick, codiscoverer of the structure of the DNA molecule, was a leading professor at the institute until his death in 2004. The institute also served as the basis for Bruno Latour and Steve Woolgar's 1979 book Laboratory Life: The Construction of Scientific Facts. Beginning in the mid-1980s, Salk also engaged in research to develop a vaccine for another, more recent plague, AIDS. To further this research, he cofounded the Immune Response Corporation (Also known as the IRC) with Kevin Kimberlin, to search for a vaccine, and patented Remune, an immune-based therapy. He was unable to secure product liability Insurance. The AIDS vaccine project was discontinued in 2007, 12 years after Jonas Salk's death in 1995. In 1966, The New York Times referred to him as the "Father of Biophilosophy." According to Times journalist and author Howard Taubman, "he never forgets ... there is a vast amount of darkness for man to penetrate. As a biologist, he believes that his science is on the frontier of tremendous new discoveries; and as a philosopher, he is convinced that humanists and artists have joined the scientists to achieve an understanding of man in all his physical, mental and spiritual complexity. Such interchanges might lead, he would hope, to a new and important school of thinkers he would designate as biophilosophers." 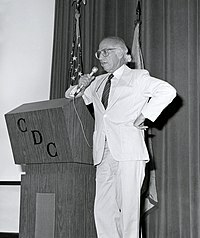 Salk told his cousin, Joel Kassiday, at a meeting of the Congressional Clearinghouse on the Future on Capitol Hill in 1984 that he was optimistic that ways to prevent most human and animal diseases would eventually be developed. Salk said people must be prepared to take prudent risks, since "a risk-free society would become a dead-end society" without progress. I think of biological knowledge as providing useful analogies for understanding human nature. ... People think of biology in terms of such practical matters as drugs, but its contribution to knowledge about living systems and ourselves will in the future be equally important. ... In the past epoch, man was concerned with death, high mortality; his attitudes were antideath, antidisease", he says. "In the future, his attitudes will be expressed in terms of prolife and prohealth. The past was dominated by death control; in the future, birth control will be more important. These changes we're observing are part of a natural order and to be expected from our capacity to adapt. It's much more important to cooperate and collaborate. We are the co-authors with nature of our destiny. His definition of a "biophilosopher" is "Someone who draws upon the scriptures of nature, recognizing that we are the product of the process of evolution, and understands that we have become the process itself, through the emergence and evolution of our consciousness, our awareness, our capacity to imagine and anticipate the future, and to choose from among alternatives." Just prior to his death, Salk was working on a new book along the theme of biophilosophy, privately reported to be titled Millennium of the Mind. The day after his graduation from medical school in 1939, Salk married Donna Lindsay, a master's candidate at the New York College of Social Work. David Oshinsky writes that Donna's father, Elmer Lindsay, "a wealthy Manhattan dentist, viewed Salk as a social inferior, several cuts below Donna's former suitors." Eventually, her father agreed to the marriage on two conditions: first, Salk must wait until he could be listed as an official M.D. on the wedding invitations, and second, he must improve his "rather pedestrian status" by giving himself a middle name." They had three children: Peter, Darrell, and Jonathan Salk. In 1968, they divorced and, in 1970, Salk married French painter Françoise Gilot. Jonas Salk died from heart failure at the age of 80 on June 23, 1995, in La Jolla, and was buried at El Camino Memorial Park in San Diego. ... in recognition of his 'historical medical' discovery ... Dr. Salk's achievement is meritorious service of the highest magnitude and dimension for the commonwealth, the country and mankind." The governor, who had three children, said that "as a parent he was 'humbly thankful to Dr. Salk,' and as Governor, 'proud to pay him tribute'. 1957, the Municipal Hospital building, where Salk conducted his polio research at the University of Pittsburgh, is renamed Jonas Salk Hall and is home to the University's School of Pharmacy and Dentistry. Because of Doctor Jonas E. Salk, our country is free from the cruel epidemics of poliomyelitis that once struck almost yearly. Because of his tireless work, untold hundreds of thousands who might have been crippled are sound in body today. These are Doctor Salk's true honors, and there is no way to add to them. This Medal of Freedom can only express our gratitude, and our deepest thanks. 1996, the March of Dimes Foundation created an annual $250,000 cash "Prize" to outstanding biologists as a tribute to Salk. 2006, the United States Postal Service issued a 63-cent Distinguished Americans series postage stamp in his honor. 2007, California Governor Arnold Schwarzenegger and First Lady Maria Shriver inducted Salk into the California Hall of Fame. 2009, BBYO boys chapter chartered in his honor in Scottsdale, Arizona, Named "Jonas Salk AZA #2357"
Schools in Mesa, Arizona, Spokane, Washington, Tulsa, Oklahoma, Bolingbrook, Illinois, Levittown, New York, Old Bridge, New Jersey, Merrillville, Indiana, and Sacramento, California are named after him. 2012, October 24, in honor of his birthday, has been named "World Polio Day", and was originated by Rotary International over a decade earlier. 2014, On the 100th anniversary of Salk's birth, a Google Doodle was created to honor the physician and medical researcher. The doodle shows happy and healthy children and adults playing and going about their lives with two children hold up a sign saying, "Thank you, Dr. Salk!" In early 2009, the American Public Broadcasting Service aired its new documentary film, American Experience: The Polio Crusade. The documentary, available on DVD, can also be viewed online. On April 12, 2010, to help celebrate the 55th anniversary of the Salk vaccine, a new 66-minute documentary, The Shot Felt 'Round the World, had its world premiere. Directed by Tjardus Greidanus and produced by Laura Davis, the documentary was conceived by Hollywood screenwriter and producer Carl Kurlander to bring "a fresh perspective on the era." In 2014, actor and director Robert Redford, who was once struck with a mild case of polio when he was a child, directed a documentary about the Salk Institute in La Jolla. ^ "About Jonas Salk – Salk Institute for Biological Studies". Salk Institute for Biological Studies. Retrieved February 22, 2016. ^ "A Science Odyssey: People and Discoveries: Salk produces polio vaccine". www.pbs.org. Retrieved March 3, 2016. ^ Zamula E (1991). "A New Challenge for Former Polio Patients." FDA Consumer 25 (5): 21–5. FDA.gov, Cited in Poliomyelitis [Retrieved November 14, 2009]. ^ a b c d e f O'Neill, William L. (1989). American High: The Years of Confidence, 1945–1960. New York: Simon and Schuster. ISBN 0-02-923679-7. ^ a b Rose DR (2004). "Fact Sheet—Polio Vaccine Field Trial of 1954." March of Dimes Archives. 2004 02 11. ^ "The Real Reason Why Salk Refused to Patent the Polio Vaccine". Biotech-now.org. Retrieved July 14, 2014. ^ Johnson, George (November 25, 1990). "Once Again, A Man With A Mission". The New York Times. Retrieved August 5, 2011. ^ San Diego Union Tribune, 20 March 2014: "UCSD to house Salk's papers", accessed July 3, 2015. ^ "Selected Questions from Student Interviews: Darrell Salk, M.D." The Jonas Salk Center. 2001. Retrieved July 5, 2017. 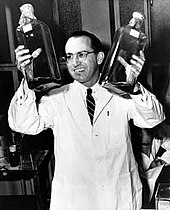 ^ "Jonas Edward Salk facts, information, pictures - Encyclopedia.com articles about Jonas Edward Salk". www.encyclopedia.com. ^ Dr. Lee Salk, Child Psychologist And Popular Author, Dies at 65 – New York Times. Retrieved August 15, 2011. ^ Roberts, Sam (July 27, 2012). "New York Census Data, Centuries Old, Is Now Online". ^ "Jonas Salk Biography and Interview". www.achievement.org. American Academy of Achievement. ^ Bankston, John (2002). 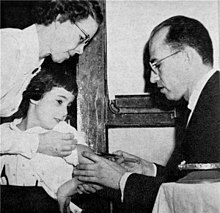 Jonas Salk and the Polio Vaccine. Bear, Delaware: Mitchell Lane Publishers. pp. 30–32. ^ McPherson, Stephanie (2002). Jonas Salk: Conquering Polio. Minneapolis, Minnesota: Lerner Publications Company. pp. 33–37. ^ "Complete Program Transcript. The Polio Crusade. WGBH American Experience". PBS. Retrieved July 14, 2014. ^ a b c d "What Price Fame—to Dr. Salk". The New York Times. July 17, 1955. ^ Offit, Paul (2005). "The Cutter incident, 50 years later" (PDF). N. Engl. J. Med. 352 (14): 1411–1412. doi:10.1056/NEJMp048180. PMID 15814877. ^ "Polio vaccines: WHO position paper, March, 2016" (PDF). Wkly Epidemiol Rec. 91 (12): 145–168. 25 March 2016. PMID 27039410. Archived (PDF) from the original on 3 June 2016. ^ Bazin, H. (2011). Vaccination: A History. John Libbey Eurotext. p. 395. ISBN 9782742007752. Archived from the original on 8 September 2017. ^ Smith, Jane S. (1990). Patenting the Sun: Polio and The Salk Vaccine. New York: William Morrow. ISBN 0-688-09494-5. ^ "How Much Money Did Jonas Salk Potentially Forfeit By Not Patenting The Polio Vaccine?". Forbes. August 8, 2012. Retrieved September 30, 2014. ^ Sherrow, Victoria (2009). Jonas Salk, Revised Edition. Infobase Publishing. p. 99. ISBN 9781438104119. ^ Cohen, Jon (2001). Shots in the Dark: The Wayward Search for an AIDS Vaccine. New York: W.W. Norton & Co. ISBN 0-393-05027-0. ^ "Salk 25 years after vaccine", Detroit Free Press, April 9, 1980, p. 31. ^ "Laboratory Life". Princeton University Press. Retrieved May 4, 2017. ^ The New York Times, Dr. Jonas Salk, Whose Vaccine Turned Tide on Polio, Dies at 80 June 25, 1995. Retrieved July 15, 2010. ^ Alberts, Robert C. (1986). Pitt: The Story of the University of Pittsburgh, 1787–1987. Pittsburgh, Pennsylvania: University of Pittsburgh Press. p. 263. ISBN 0-8229-1150-7. Retrieved December 7, 2009. ^ "March of Dimes Awards $250,000 Prize to Scientists Unraveling the Causes of Muscular Dystrophy". Lifesciencesworld.com. Retrieved July 14, 2014. ^ Salk inducted into California Hall of Fame Archived January 10, 2008, at the Wayback Machine, California Museum. ^ Hiltzik, Michael (October 28, 2014). "On Jonas Salk's 100th birthday, a celebration of his polio vaccine". Los Angeles Times. Retrieved October 28, 2014. ^ "IMDB bio of director Tjardus Greidanus". Internet Movie Database. Retrieved October 28, 2014. ^ "IMDB bio of Laura Davis". Internet Movie Database. Retrieved October 28, 2014. 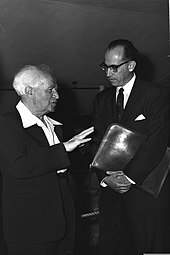 Wikimedia Commons has media related to Jonas Salk.